The Quick Guide to ordering sails. Nylet - Model sailmakers to the world ~ THE professional Master Sailmakers. Creating the Finest model racing sails & replacement kit sails (see price list - over 600 items priced). Sails made to your drawing/sizes. NYLET. Master sailmakers since 1932 - over 100 years of experience - Quality First - The Very Finest Finish. Using technological advances in materials coupled with innovation, expertise and tradition over nearly 90 years to bring you the very finest model sails. Nylet sails with "wind catching" shape - designed to enable your yacht to respond to every wind condition. Look in our price list first to see if the sails you require are listed; if not then see our "150 sails list". Quick guide to ordering please scroll down. To contact us, click on right link on top bar. NYLET - Master sailmakers - THE professional model sailmakers since 1932. Using technological advances in materials coupled with innovation, expertise and tradition over nearly 90 years to bring you the very finest model sails. The longest established professional model sailmakers in the world ~ fine quality model yacht sails, perfect cut and finish ~ quality first; world-wide mail order since 1958. 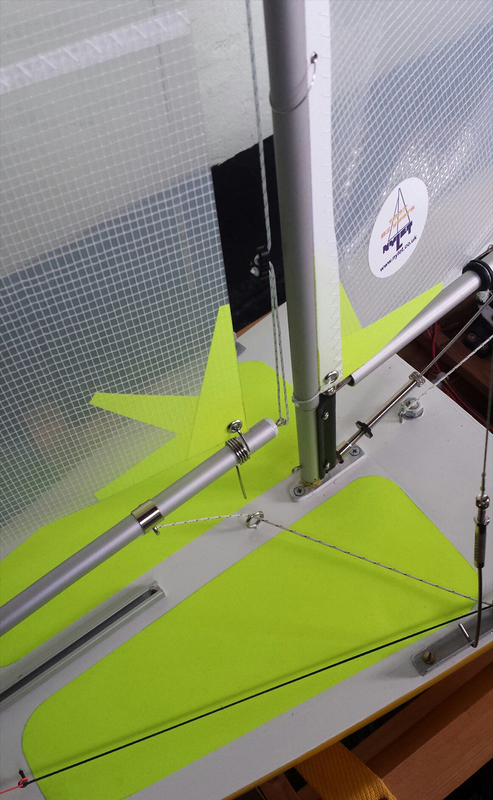 Comprehensive sailmaking service, any size sails made to your drawing/sizes. Read more about sailcloth types available in "news". A yacht's sails are its 'engine', so fit the best, don't settle for less. Speed up your yacht with our renowned "wind catching" sails. For price list (over 600 items) see link/button below. For listings of other available sail designs then click on '150 sails list' below. To make an order/enquiry - phone or email us and we will be pleased to help (click on the 'contact' link on top bar). If the sails for your own yacht doesn't appear on our '150 sails' list (or our price list) then you must enclose sail dimensions for us be able to quote you! How to make paper templates (if required) for making, click on 'help' on top toolbar. For detailed information on racing sails and "Heritage" sewn sails click on the next yellow button under this message. Information/quick guide on ordering IOM/racing sails, standard sails & replacement kit sails please scroll down. NYLET sails, racing, cruising, Heritage, Vintage - choose your style. Fine racing sails made for the IOM (One Metre class); we also make "replacement" sails for Chinese and other yachts such as the Seawind, Victoria, Fairwind, Voyager II etc; see section 4 of price list (see also "150 sails" list). Any size sails made to your special order. Just a reminder, Christmas isn't so far off now, don't leave ordering sails and rig kits to the last minute, we get busier with orders prior to the Festive Season and so best to order early to avoid disappointment. How to order sails from the price/product list. 1. Select the suit you wish to order by part number. 3. Choose type of mainsail luff; i.e. cord (or tabs), eyelets, luff hooks, or wire. 4. Stipulate the colour required for corner patches and if you require 'fine' fingers. (In the absence of your choice of colour we will fit white corners). 5. Please tell us how you wish to pay. 6. Phone or email your order (click the 'contact' page); card details should not be emailed, please phone us. A tip - double check your order and give us all the information we require initially, altering or adding requirements later can lead to errors. For prices please click yellow button (scroll up). If the sails you want to order aren't in our "150 sails" list or the price list then we will need sizes/plan/drawing to quote you. Please note that any paper sail templates or plans sent to us to use for cutting/making will be deemed to be dispensible (unless advised otherwise) and may be cut up to use as templates (if provided on one sheet) and finally disposed of. Using skills handed down over 5 generations and nearly 180 years we take pride in our work. Using the finest materials we make sails for modern racing yachts, cruising yachts and also vintage timber yachts. We make any sails to customers plan, drawing, or templates. Sails made for sailing and display/museums in the finest cotton cloth. World-wide mail order since 1958. The Victoria sails arrived this morning. As usual they are absolutely superb. Thank you so much. The sails for my Dragon Force came today; a great product and excellent service - can't wait to try them this weekend. The IOM sails arrived and absolutely fantastic, really pleased and more than happy to recommend your workmanship. I just wanted to say a really big thank you for the lovely suit of (Dacron Heritage sewn) sails you have made for my vintage 4 foot model J Class sloop. I have put the sails on the spars and they look superb! They are beautifully made as I expected them to be, but in all fairness it is actually better than I had even hoped for. The Canterbury J sails have arrived in perfect condition thank you very much. Very pleased with the excellent quality you have produced. Just a few lines to thank you very much for the phone call and the excellent delivery, I received the sails just a few hours after your call. As for the sails, with just a few dimensions on a sketch you have produced a set of racing sails that go far beyond excellent, they are so much more than I expected, I just hope I can complete my yacht to the same standard. Thank you very much. Thank you so very much for the wonderful suit of sails, the stitching is just perfect, you are a professional (my wife commented on your work, she is a sewing machinist!). Thank you again, I am over the moon. Absolutely magnificent (cotton) sails, the guys at the Club were amazed at the quality! Hello Frank, the sails were waiting for me when I returned from a week away. They are in perfect condition and look superb, just like sails previously made by you. Thanks for putting them through with the others, what super service! Enjoying the new Seawind sails. Far more competitive than the stock sails. You are a star. I've never won anything before with my IOM yacht but with your sails newly fitted I won the series of races. An excellent job, marvellous, thank you. Many thanks, sails arrived OK, great job. Sails came yesterday, great suit, can’t wait to fit them probably over Easter. The KINGSWINFORD boat members highly recommend you for your sailmaking. Great, thanks again. I can confirm the sails and bag arrived safely yesterday. I am very pleased with them and must say you provide an excellent service. I will certainly come back to you for more parts and wholeheartedly recommend you to other model enthusiasts. At last I can thank you for the excellent suit of sails that you made for my Marblehead. She was launched yesterday and sailed beautifully - the sails set a treat and looked terrific. Your efforts are much appreciated.